Respro Hi-viz ankle bands are just brilliantly simple safety aids made from dual sided, washable neoprene that fit in a flash around the ankles, doubling as handy trouser-clips into the bargain. Lycra can induce slight slippage beyond ninety odd rpm but before you all start sniggering and picturing geography teachers, brown cords and three-speed sit up 'n' begs, they're fine with 3/4lengths, the latest generation of civilian styled cycling trews and can even be worn as arm bands should you prefer. Measuring 25cm long by 5cm wide, these strips should fit the majority of adult ankles and children from around eight or so upwards thanks to simple, reversible Velcro closures that feature Scotchlite one side, neon yellow the other-perfect for scuttling to the office in the morning gloom before bowling back sporting the reflective side. Unlike the plastic coated types impregnated with LEDs, it takes ten seconds to achieve a smooth, seamless profile whereupon they're pretty much forgotten from the moment you hop in the saddle and the key to their effectiveness lays in the simple physics of revolving light. Rather like the ubiquitous blinky, cadence catches the eye and becomes more effective the faster you pedal - the reason pedal reflectors are also such effective visibility aids. I almost never cycle in jeans but since a parcel had been left at my local post office and a friend wanted me to investigate an 'Interesting' squeak emanating from her bike's bottom bracket region, I donned the bands, leapt aboard her hybrid and whizzed elegantly through the village, collected said parcel and sprinted the mile or so home. Turning a steady seventy, the bottoms of my trousers never came close to catching in the chain and remained exactly where they should have been. 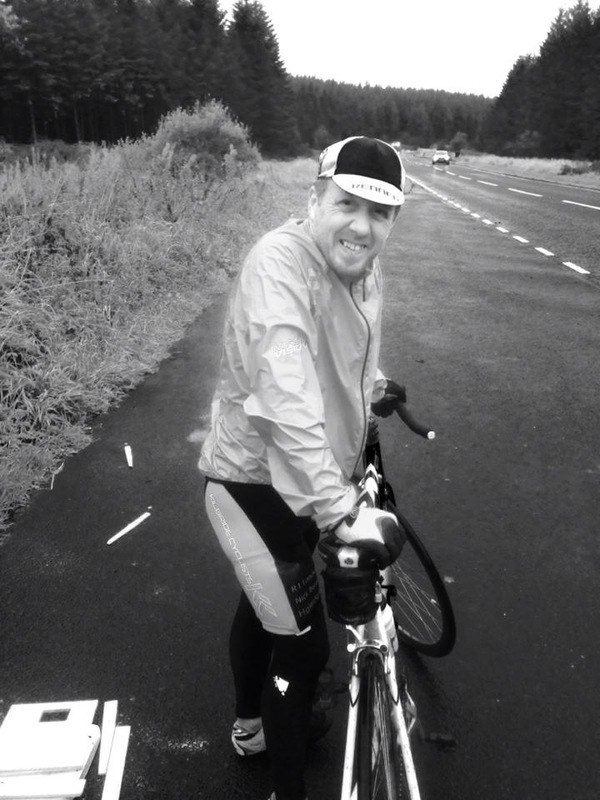 Waiting until dusk, I decided to head the 10 miles into town so got kitted up and gently woke the Univega. Cantering at close to 90 rpm, I found myself chuckling at how effective they were- visible to a good 400 yards along the lanes Scotchlite side up, although one irate Mondeo driver took offence at my lighting ensemble, screaming something about the twilight zone - you wouldn't think they'd scare so easily in Essex. Around town, their efficiency drops to a very respectable 300 yards but even the chav chariots with their lowered suspension and race-cans gave me a wide, albeit not entirely abuse-free berth. Brilliantly simple visibility aids that double as nifty trouser clips. "Respro ankle bands are the ideal product for increasing visibility for both day and night time use. They incorporate Scotchlite on one side and Day-Glo yellow nylon lycra on the other side. Two Velcro fasteners make the product quick and easy to use and can be stored readily when not in use"
Very unobtrusive, although can absorb and retain water following a heavy shower. Respro ankle bands are brilliantly designed safety aids that also keep flailing trousers from catching in the transmission.My only very minor gripe is the neoprene can absorb and retain moisture during heavy showers. £5.99 a pair, maybe ... £15.99 a pair, no way. I have had one of these for 2 years now. They slip easily with wool pants, less so with cotton. No way will they work with children--they are too loose on my 11 year old boy's ankles. The council gave out free snap-bands in a promotional pack some time ago. I use one when I'm wearing normal trousers on the bike. 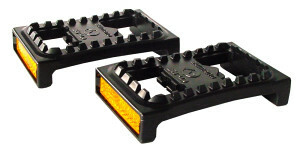 For visibility pedal reflectors are better, like the Shimano PD-M22s that are now on the commuter. These are great, been using them for years. Always good to have some moving reflection to draw attention to my presence. Also double up as trouser 'clips' if I pop out from the office during the day. They've been washed a few times and have stood up well. In my book they're well worth the money if you are on the road in the dark. I've got a pair of these and they're the best ankle bands I've ever used. Extremely comfortable, highly visible, and they are even able to be secured when I wear my waterproof over trousers. I appreciate that 15.99 is rather more than you might pay for some similar products, but as the saying goes- you get what you pay for! Sorry, but £15.99 a pair is taking the P*ss ... I got a pack of 4 LED bands from Aldi for £5.99 ... that's £3 a pair, five times less than these and they are very effective. Relax nbrus buying these isn't compulsory. £15.99 may sound a little salty but the man from Respro won't be coming round to your house to demand his dosh any time soon. I haven't used these but I have used snap on ankle band reflectors and reflective trouser clips and I always end up taking them off because I find them so uncomfortable on my sensitive/fat ankles. Plus the snap on bands have an irritating habit of not staying snapped on enough to act like trouser clips. I'd say if these are comfortable surely they are more likely to get worn, do their job and justify the investment. I have used for years a very similar band, uses strong Velcro, so you can adjust them to any tightness, so therefore fits any size of ankle and wouldn't use anything else,from Madison and can be bought for between £3.99 - £4.95. So saving a whopping £10.00 on the ones above ! I've had a couple years out of my Aldi pair, and those are still going strong ... still on original batteries too. Mustn't get out in the dark much then nbrus as long as we can be seen though - keep safe! I've got the Aldi ones and I've got these. I thought these were a bit pricey when I bought them, but they are still going strong after 4 1/2 years and they are very reflective. I don't think my Aldi ones will still be going strong after that time but they were only £4.50 for 4. I don't begrudge either of them their price. Let's face it, these things only work when the moron who otherwise would not have seen you, actually sees you and doesn't spread you over the road. What value do you want to put on that? Having said that, come on Respro, how much do they cost you to make? You'd sell a load more if the price was lower I suspect.